New York, NY (December 29, 2016) —Seasons Greetings and Happy Holidays from WEDO! It’s time to say goodbye to 2016 and welcome in the New Year! 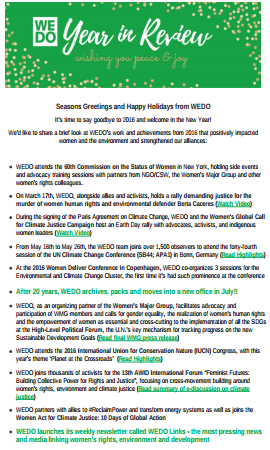 We’d like to share a brief look at WEDO’s work and achievements from 2016 that positively impacted women and the environment and strengthened our alliances.